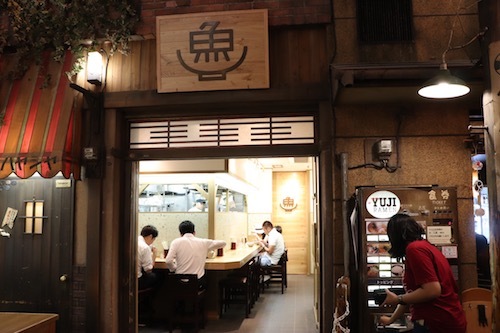 Home › Style › Try all the popular veggie-vegan ramen at the “Shinyokohama Ramen Museum”! Vegan ramen has been a hot topic lately. 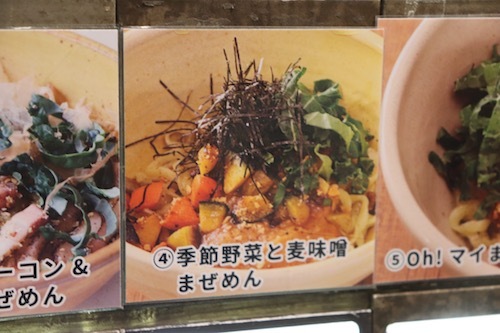 Did you know that there are various famous vegan ramen dishes from within and outside of Japan available for you to taste at the Shinyokohama Ramen Museum? 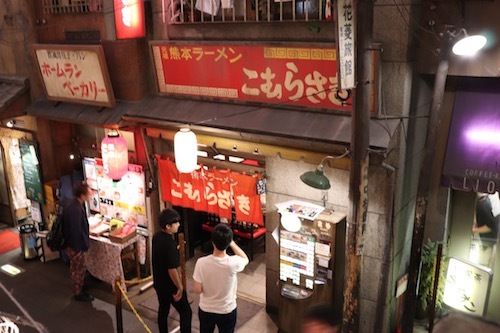 This time, a Vegewel writer who has a passion for ramen has recently visited the Ramen Museum to report all about ramen including the types of noodles and soups. 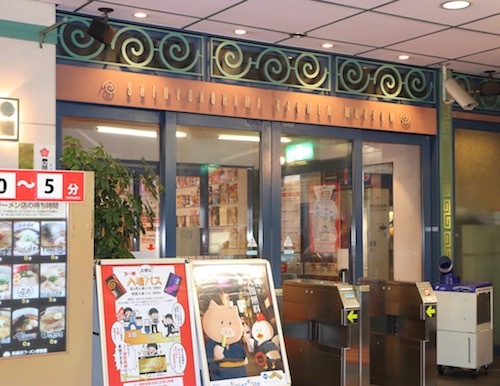 She also provides a report about other attractions at the Ramen Museum! 1 Catering for vegetarian and religious needs. Barrier free, a welcoming approach to all customers. Catering for vegetarian and religious needs. Barrier free, a welcoming approach to all customers. 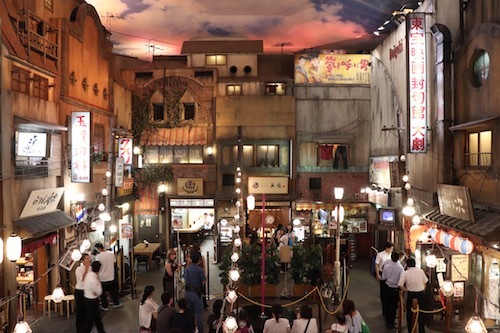 Shinyokohama Ramen Museum, commonly known as “Ra-Haku”, is about 5 minutes walk from the Shinyokohama Station. The above is the entrance where visitors can buy their entry ticket to the museum. The ticket is valid for a day’s visit, and this gives you the opportunity to return to the museum multiple times throughout the day that the ticket is valid! 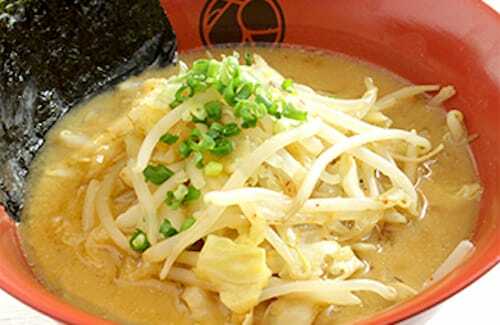 Ramen restaurants in Europe and in the United States often provide vegetarian options to their customers. 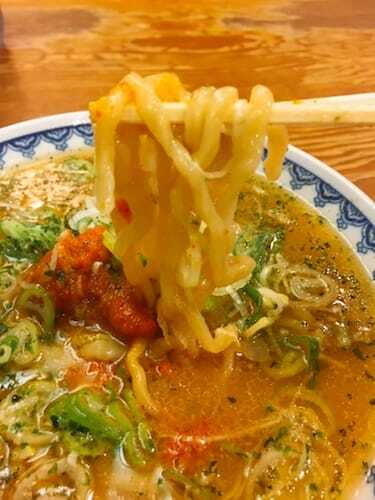 And therefore, Ra-Haku wishes that Ramen as a Japanese food culture will become wide spread and increase in popularity and also that Japanese ramen will become more inclusive to various dietary needs. Ra-Haku therefore, positions their veggie-vegan ramen as the “global standard ramen”. Above is a guide given out at the museum for people with a vegetarian diet. You can receive this at the information office at the Ra-Haku. Recently there is an increased number of tourists from Taiwan and Islamic countries visiting, and therefore the Ra-Haku has an increased demand for veggie-vegan ramen. 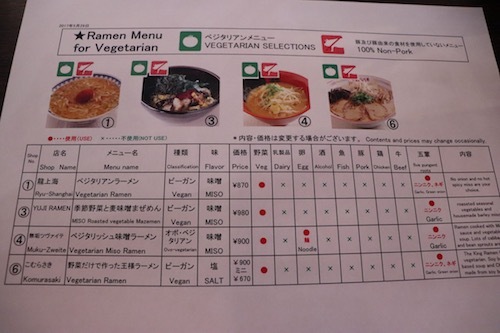 The vegetarian friendly menu has a green vegetable logo at top left of the image. 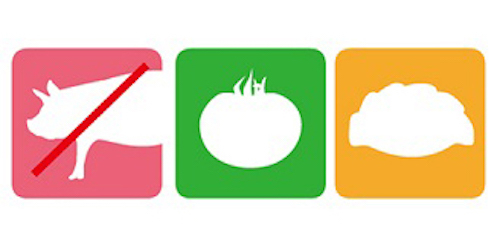 The pink pig logo refers that the ramen doesn’t use any pork ingredients. For your information the above right logo is for gyoza. The reference chart and pictograms are easy for people to understand and they can be a model example for other restaurants to follow. Ra-Haku’s adoption of a global standard is not limited to just food. 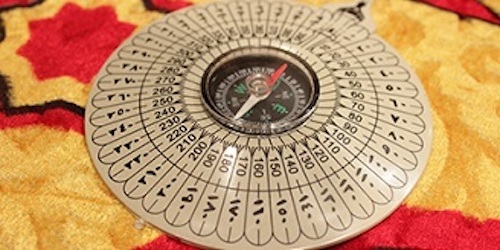 The above is called Qibla, a Muslim prayer compass. People with Islamic beliefs pray 5 times a day. For them to pray, they need a space for prayer, a prayer mat and the Qibla compass. Ra-Haku accommodates these needs for Muslim people. Now I would like to introduce you to various veggie-vegan ramen dishes from various ramen restaurants! 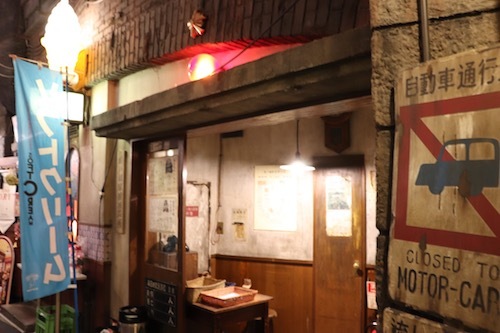 The original Kumamoto ramen restaurant established in 1954. 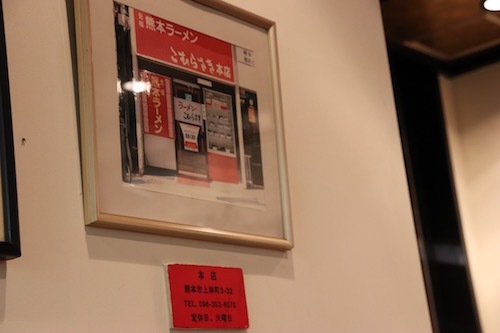 Inside the restaurant, you can see a snapshot of the Komurasaki in Kumamoto. You can also find images of the Kumamon, a mascot created by the government of Kumamoto Prefecture, and you can feel their love for their home town Kumamoto. 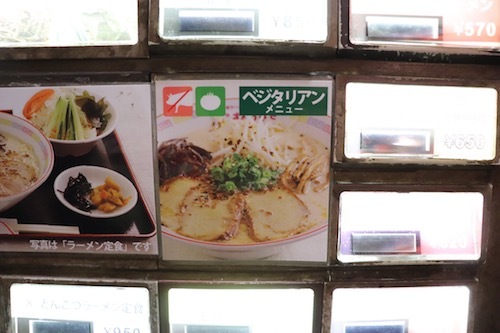 “The King of veggie ramen” 900 yen. 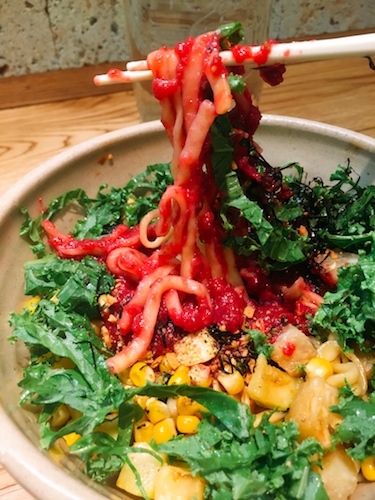 Look at the above, it looks exactly like the usual ramen, and at first glance you could not tell that this is a vegetarian dish! The original noodles are made from flour. They are slightly thicker than the Hakata ramen noodles. The soup comprises of a vegetable-based broth, salt, and soy milk and is very rich. 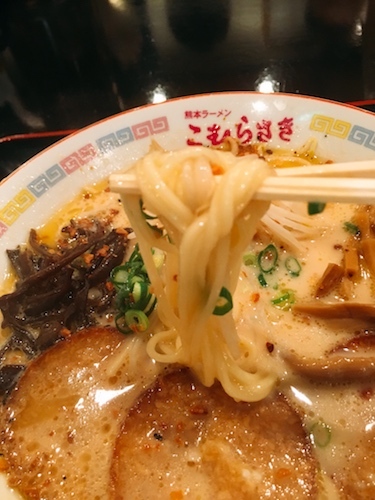 Toppings are standard Kumamoto ramen style which include Kikurage mushrooms, bean sprouts, and menma (seasoned bamboo shoots). 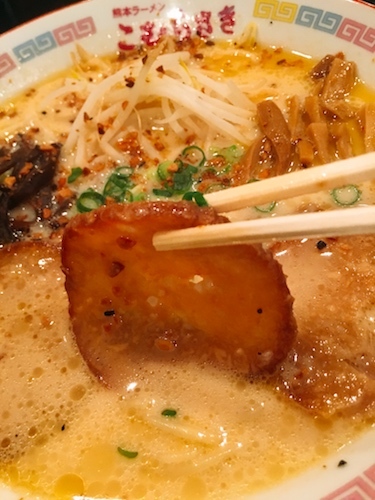 I think the special taste for Komurasaki ramen must come from “browned garlic sprinkles”!? Some veggie ramen can taste rather bland, but this dish isn’t, and the aromatic browned garlic leads the flavor well. Looks exactly like a slice of Chashu (seasoned roast pork)! But this is actually made from soy meat. Komurasaki is the only restaurant in Ra-Haku which has a half-sized portion of vegan ramen available for customers to order. Yuji Ramen is a restaurant which was opened in March 2017 by Mr. Yuji Haraguchi who was working in New York. The selection of the vegetables in the above vegan ramen dish changes seasonally, so you can enjoy a different taste every season. Let’s try this dish! 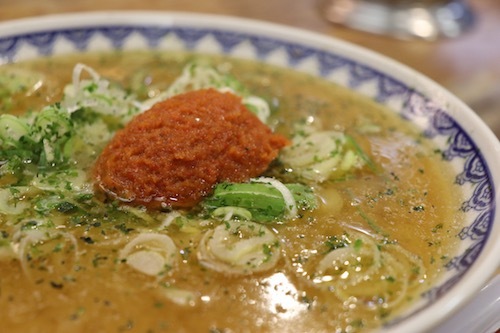 “Seasonal vegetables and Barley miso mazemen (a brothless style ramen)” 980 yen. 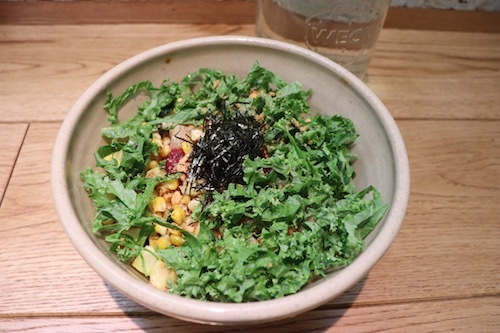 As I visited in August, the ramen has plenty of summer vegetables such as zucchini, corn, kohlrabi, and beet. It looked like salad ramen to me and I thought it maybe too plain, however it was far from plain. The Yuji’s original barley miso was very rich and strong in flavor! They slow cooked the vegetable-based broth and when it has thickened they mix with a barley miso. I could really taste the summer vegetables and beet based broth and the barley miso. As you eat, you can mix the barley miso into the ramen as well as mixing in a soy sauce based sauce. You can enjoy different flavors in one dish. I love beet, so I was so pleased to be there in summer. On top of this, the thick wavy handmade noodles mix so well with the miso and it was great. 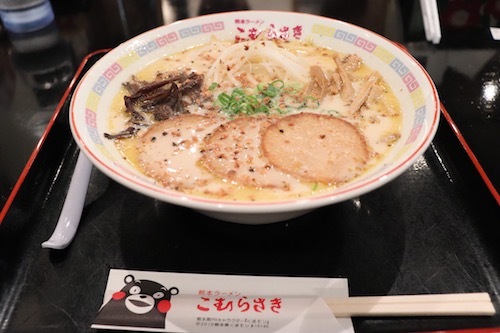 The original Karamiso(spicy miso) ramen was developed in Yamagata in 1960. You can surely enjoy this original flavor with the vegan ramen! The Shiitake mushroom and Konbu seaweed based soup is transparent and you can taste a hint of sesame oil flavor. I recommend you first try the noodles with the original soup without mixing in Karamiso! Then gradually mix the Karamiso into the soup and enjoy the changing flavors. In the above image, can you notice that the color of the soup has changed? The noodles are so thick and wavy and they can carry the flavor of the soup really well so you can enjoy the yummy combination. 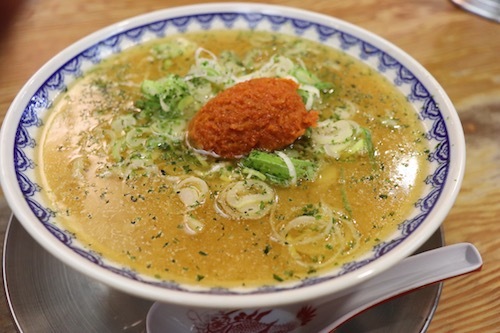 “Vegetalish Miso ramen” 900 yen. The above ramen is not for vegans, but for vegetarians who eat eggs. The soup is rich, and made with miso sauce and a vegetable broth. The noodles are made using wheat flour for pizza and Durum wheat flour which is used for pasta. 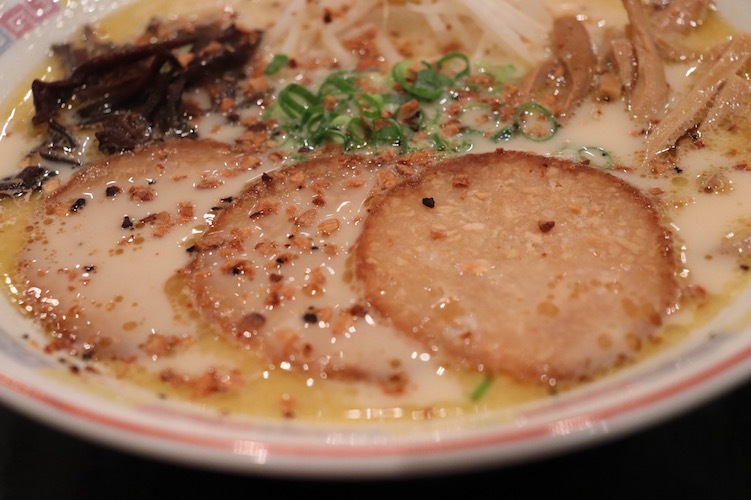 There is another ramen from Muku Zweite which I would like to introduce to you! It’s the first gluten free ramen in the Ra-Haku. It’s very difficult to make gluten free/ wheat free ramen as wheat is contained not only in noodles but also in soy sauce. Therefore the seasoning for the menma (seasoned bamboo shoot) and the chashu (seasoned roast pork) has to be replaced. Well done to Ra-Haku which is setting the global standard! The gluten free ramen does not have a vegetarian dish yet, but we look forward to its forthcoming development. ”Gluten free ramen” 950 yen. 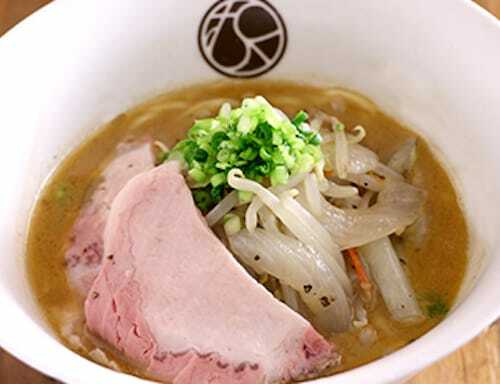 For the gluten free ramen, straight rice noodles are used, and the restaurant uses separate cooking pots in its preparation for this special ramen dish which most ramen restaurants have found difficult to provide. It has an interesting topping of German sauerkraut mixed with miso sauce. Ra-haku has revived the retro street culture of the good old days from the Showa era. There are various events at the center stage. When I visited, there was a dance show! or if you have small children with you, you can spend the day at the Ra-haku like visiting a theme park. There are many things you can enjoy beyond eating ramen! Let’s enjoy Ra-Haku!